NEW BRITAIN - The Central Connecticut women’s basketball team snapped Fairleigh Dickinson’s five-game win streak on Monday night in dominating fashion, 76-56, inside Detrick Gymnasium. The Blue Devils held the Knights to 23-for-62 (.371) shooting. CCSU improves to 4-7 in the Northeast Conference and 4-18 on the year with its second straight win, while Fairleigh Dickinson drops to 6-4 in the NEC and 14-8 this season. The Blue Devils out-rebounded FDU 47-29, led by junior , who gathered seven boards and netted a game-high 21 points. Junior dished out a game-high seven assists to go along with 19 points for CCSU. The Blue Devils shot a season-best 46.8 percent from the floor on 29-of-62 shooting. Patterson ripped through to the left baseline and finessed in a runner in the closing seconds to give Central a 15-14 lead heading into the second quarter. CCSU then scored the first seven points of the second quarter, adding to a 12-0 run to force the Knights to call a time out with 7:36 on the clock, down 23-14. FDU’s Madelynn Comly put an end to the Central spurt with a tough finish in transition with 5:03 left before halftime, scoring the first points for the cold-shooting Knights since the 1:53 mark in the first quarter. Junior connected on 3-of-4 shots in the last five minutes of the first half, draining eight points off the bench. Patterson dished the ball back to a trialing Lydon for a three in the closing seconds to put an exclamation point on a tremendous first half performance from the Blue Devils. CCSU held a 39-23 halftime lead, tying the least amount of first half points the Blue Devils have surrendered this season. Fairleigh Dickinson’s Amina Markovic registered her second double-double of the season with 11 points and 10 rebounds. Lauren Francillon led four players in double-figures with 14 points and added eight boards. 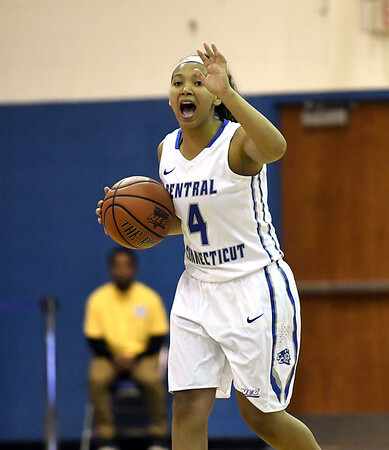 CCSU will look to make it three in a row against Bryant at home on Saturday, in the first game of a doubleheader starting at 1 p.m., to be streamed on ESPN3. Posted in New Britain Herald, CCSU on Monday, 5 February 2018 22:27. Updated: Monday, 5 February 2018 22:30.